DETAILS: This stretched canvas is available for all NFL franchises and features the official stadium of his favorite team, packed to the rafters with fans that came just to honor him! 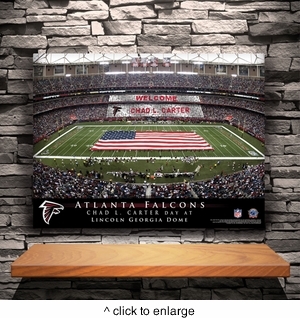 Ideal for the die-hard fan,and includes the name of the team, stadium, and honoree. All NFL Teams Available. PERSONALIZATION: Personalized with fan's first and last name up to 28 characters.